TV REVIEW Doctor Who 5.09 "Cold Blood"
The one where: The killing of Alaya nearly sparks a war, but with the help of a peaceful Silurian elder, the Doctor puts them back into hibernation. Verdict: Oh my god, they killed Rory ! Again! Seeing him cark it for the second story running was so South Park that my initial reaction was to guffaw, but then it sank in – and it hurt. The one thing this season has been lacking is the sort of emotional intensity Russell T Davies delivered on a regular basis (now that I've got used to it I miss crying at Doctor Who , damn it!) and boy, does this deliver. The scene where Amy loses her struggle to cling on to Rory’s memory might just be the single most harrowing sequence in Who ’s long history. I mean, let's face it, Adric was pretty annoying. It’s wossisname! : Stephen Moore (Eldane, the Silurian elder) voiced Marvin in The Hitchhiker’s Guide To The Galaxy (and was Kevin the teenager's dad). Let's all take a few moments to enjoy his moment of pop stardom , shall we? Nice threads: Loving Eldane’s robe. He looks like he should be in Sun Ra’s band. Look familiar? 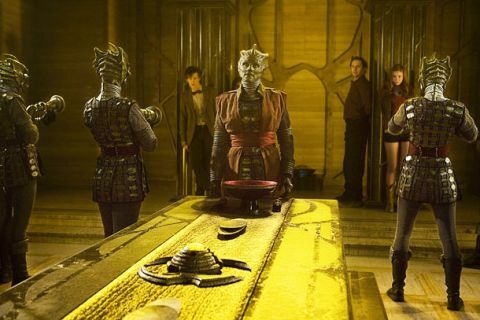 : If the sight of the Silurian council chamber (see above) caused a shiver of déjà vu, it’s not surprising. That streaky-walled chamber is the Temple Of Peace in Cardiff, here making its fourth appearance in Doctor Who – the first time, it was the Manchester Suite of Platform Five in “The End Of The World”. It also featured in The Sarah Jane Adventures (“The Mona Lisa’s Revenge”), as an art gallery . Bit of politics: Is this the first Doctor Who story to articulate the “What’s in it for us?” viewpoint of immigration? Never mind all that stuff about knowledge and technology - if he really wanted to clinch the deal, Eldane should have said, “Oh, and we’ve got some really reliable plumbers”. One minute Malohkeh (the scientist) is a Silurian Dr Mengele, preparing for a live dissection of Amy, seemingly indifferent to her terror. The next minute, he’s a caring, foursquare fellow. Huh? Wouldn’t the sonic screwdriver’s ability to destroy weapons have come in handy, erm, about a million times before? Which reminds me of something that bugged me last week: how come Alaya is the only Silurian warrior who doesn’t carry a weapon? Why does the Silurian poison cause mutation, instead of death? And what kind of mutation is it, exactly? Do the Silurians actually need those “oxygen pockets”, given that they’ve drilled lots of holes to the surface, which one might have thought would, you know, let in air? Why does Tony have to stay in the Silurian city for the rest of his life? Couldn’t the Doctor just nip back in the TARDIS in half an hour’s time and take him home once his spin cycle’s finished? How many people do you know who own a taser? Speculation: I sincerely doubt that’s the last we’ll see of Rory, so dry your eyes. It’d be a terrible waste if it was. Rory’s a fantastic companion – more appealing than Amy, in my opinion, who I’m still struggling to fully warm to. Anyone think their engagement ring will have an important part to play in a future episode? They focused on it so much that it must surely have some further significance.